Upon receiving your tree, immediately water the pot very well with water. If the tree is a little droopy from shipping, don’t fret, it will spring back after a good watering in a few hours. If you see some reddish spots/marks on the leaves- this is normal, not a disease or problem. Rainbow Eucalyptus will drop and regrow many leaves while they are young. You may even see entire branches drop and then another grow nearby. 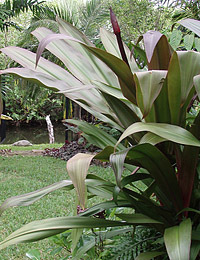 It is very common for Rainbows to have bright red to pink new leaves, along with some reddish coloration on older leaves. Sometimes you may see a few leaves have been cut or removed- this is intentional. When packing your tree, we may reduce or remove a few leaves that the plant was about to drop anyway- we do this to help the tree lose less moisture during shipping. Brand new leaves should regrow in the same spot, or nearby with regular watering / fertilization. If your tree is in a 4″ pot, you will likely notice roots poking out the bottom holes. If so, you can carefully bump your tree up to a 3 gallon (10 inch) pot. 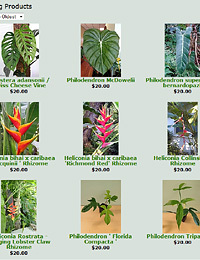 You can skip the 1 gallon pot and go straight to a 3 gallon, as Rainbow Eucalyptus grow and root very quickly. Bumping your tree up to a larger pot will help it stay more properly hydrated, as the additional soil will hold extra water. Miracle Gro’s new “Moisture Control” bagged soil contains Coco Coir- which is an excellent (sustainable) alternative to peat. Keep the tree in a partial sun to full sun, and allow good air circulation, but avoid constant heavy winds until it is a bit larger. If you plan on siting your Rainbow in full sun, it is a good idea to acclimate your tree to this light level over a few weeks. Start in a partial sun and gradually move into more sun over time – remember to keep it watered at all times. 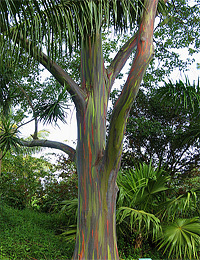 Rainbow Eucalyptus come from tropical areas, so they require humid air. If you are in an arid climate, regular misting is recommended, and give extra water to the roots on a regular basis. Once you have fully rooted your tree into a 3 gallon (10″) pot- it is ready to be planted out if you decide to do so. Dig a hole 2x as wide and 2x as deep as your 3 gallon pot. Do not use 100% native soil in the hole- you will want to surround the tree with a mix of 2/3 Peat Moss or Coco Coir and 1/3 native soil (if sandy and not too hard or clay) or sandy potting mix. Carefully remove the tree from the pot, being careful to leave roots intact as much as possible. Don’t rough up the roots before planting- leave them in a rootball. Tamp down a bit and water in a few times. Use insert a tall pole (with room for future growth) and attach tree to pole- not too firmly- (allow for some small movement) to keep it straight and as support in high winds. Bamboo poles or green poles from box stores work well. Take extra soil and build a 6″ berm around the tree trunk, about 12″+ out from the trunk. This will help hold water and aid in manual watering. 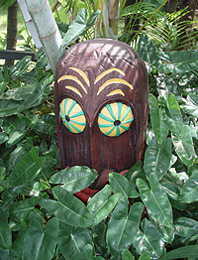 You can add a bit of mulch inside to help retain water, but keep mulch off the trunk. Fertilize with HALF strength liquid fertilizer (Miracle Gro, Peter’s etc) about once every 1-2 weeks. Use a good true time-release fertilizer such as Osmocote, Nutricote or Dynamite to top dress with a granular. Also AVOID ACIDIC ‘ROOTING STIMULATORS’ as these can be a bit harsh for a young Rainbow’s roots. The biggest thing to remember is KEEP THE TREE WELL WATERED for the first year. The second year, if in the ground, it will start to be able to find its own water, but local irrigation is still highly recommended. Also, the more water you can supply, the more the trunk will swell and bark peel- this is how you get the colors on the trunk!